You better have a good grip on your shotgun because this round packs a punch! Winchester has been manufacturing firearms and ammunition for over 150 years, so when you purchase Winchester, you’re purchasing good old American pride. If these rounds existed back in 1866 when Winchester was founded, the wild west would’ve been won in no time! 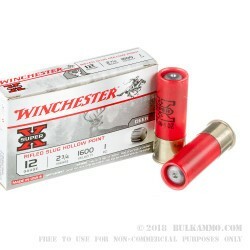 These Winchester Super-X 12 gauge 2 ¾” rifled hollow point slugs will make light work of pretty much anything in its way. This round has a muzzle velocity of 1600 feet per second and features a unique two-piece sabot slug to improve accuracy. What’s a sabot slug? 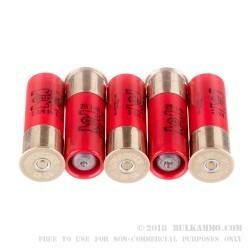 Slugs that are smaller than the bore of the shotgun and supported by a plastic “sabot.” They are traditionally designed to engage the rifling in a rifled shotgun barrel and create a ballistic spin on the projectile creating stabilization and accuracy. This round has been touted as the “new standard in slug hunting!” (By the way I don’t mean those slimy things.) 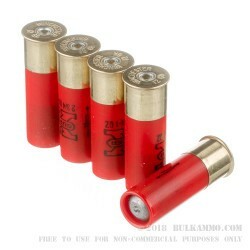 These are for big game such as deer, boar, bear, etc. Of course, if you want to punish a watermelon or two, that would be fun as well. If these bad boys are for you, you will receive 50 boxes of 5 rounds each. 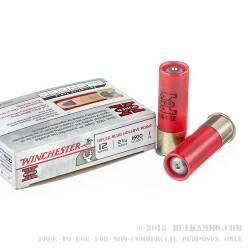 These rounds are designed for use in rifled choke tubes or fully rifled barrels. Incrediable power, lots of recoil.